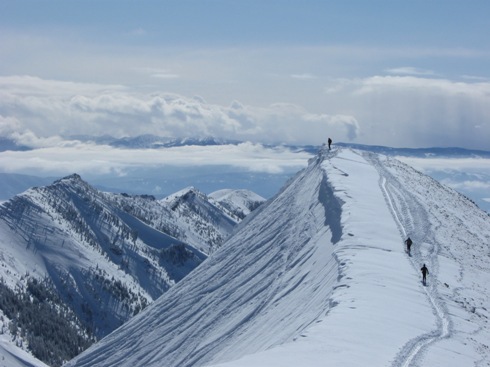 Sidecountry is defined as out-of-bounds, backcountry terrain that is accessed from a ski area. 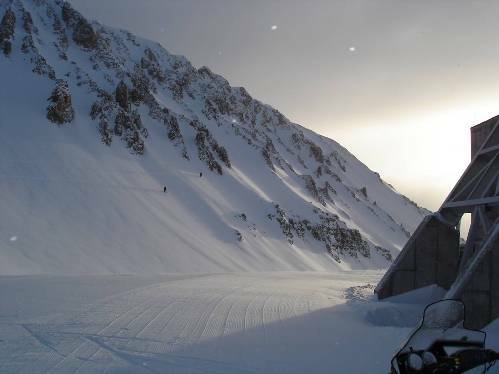 The close proximity to a ski area makes accessing these areas easier, but does not provide any safety as there is no avalanche hazard reduction or ski patrol services. Backcountry Avalanche Awareness from Big Sky Search and Rescue on Vimeo. What happened? Listen to an interview of GNFAC staff by Michelle Wolfe from 95.1 the Moose. Watch a the YouTube videos (First, Second) of the entire Saddle Peak Avalanche Forum held March 4, 2010 at the Bozeman Public Library. The GNFAC discussed the weather, snowpack and human factors that led up to the February 16 avalanche. The first step, besides reading this page, is taking an avalanche class. Many classes are offered in southwest Montana. Check out our calendar. Classes are also offered in other states, and several online tutorials are available. Education and good decision making are key to safely skiing outside the ski areas. Watch a movie about skiing the backcountry near Bridger. This movie was produced in cooperation between Bridger Bowl and the Gallatin National Forest Avalanche Center. Read an article by Doug Chabot from Carve Magazine. Read an article about skiing safely in the sidecountry at backcountry.com. The basics always apply even if you are just making one run in the sidecountry. 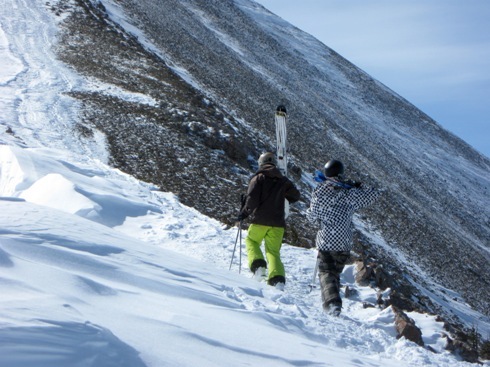 Experienced backcountry skiers always follow these rules and make no exceptions. 1) Travel with a partner. 2) Carry a beacon, probe and shovel and know how to use them. 3) Travel one at a time in avalanche terrain. These skiers are not traveling one at a time. They are all exposed. 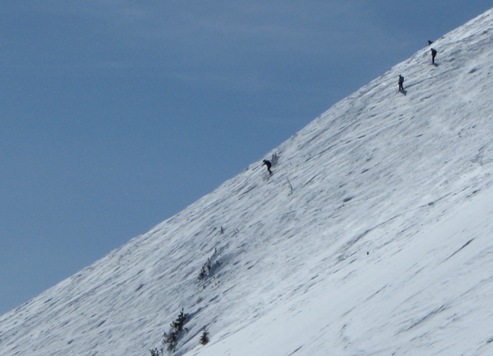 If this slope avalanched, all three skiers would have been caught and possibly killed. It doesn’t matter if you are 10 feet from the ski resort boundary, YOU are responsible if you get hurt. 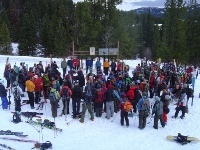 The Bridger Bowl Ski Patrol is NOT obligated to help you. They must remain prepared to help injured skiers inside the resort and not spend their resources outside the boundary. Skiing out of bounds requires personal responsibility for your actions, so choose your partner wisely. Imagine hauling a badly injured skier out of one of these drainages on the west side of the Bridger Range. It would be extremely difficult. Rescues are run by highly trained volunteers in Gallatin County Search and Rescue. These volunteers are commonly found at home or their day jobs and will not reach you for several hours even in the best circumstances. It may take many more hours before you get to a hospital. Helicopters and snowmobiles can shorten this time, but their use is severely restricted by difficult mountain weather, heavy timber and rugged terrain. Do not count on being rescued by a helicopter. slab avalanches and point releases (sluffs). 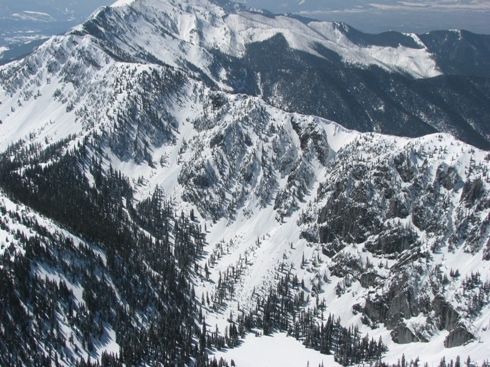 Numerous hazards exist on the east side of the Bridger Range, the same aspect Bridger Bowl is located. 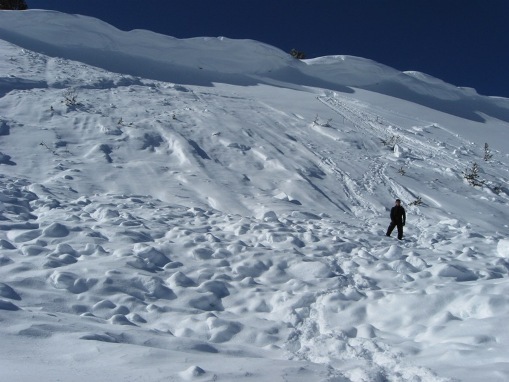 These hazards include avalanches, unmarked obstacles, cliffs, confined avalanche paths. One notable hazard is a 200 foot cliff band on Saddle Peak just south of Bridger. Many people ski just outside the ski resort boundary unaware of these cliffs because they are not visible from above. Any avalanche, large or small, can easily sweep you over these cliffs and fatally traumatize you. 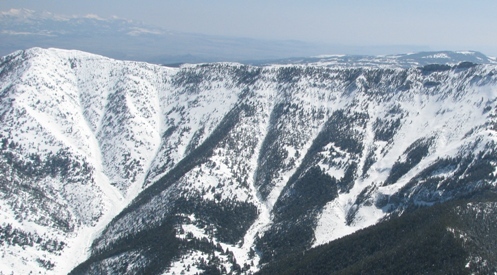 Many people ski above these cliffs that lie just outside Bridger's boundary. It only takes a small avalanche to sweep you over these 200 ft cliffs. 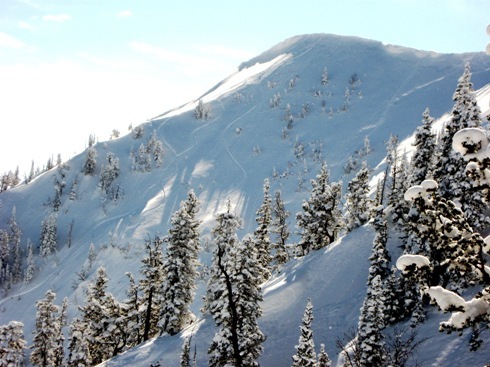 Many other deadly terrain features exist to the north and south of Bridger Bowl. An avalanche that doesn’t sweep you over a cliff can run you through trees and easily cause serious injury. Many of the avalanche paths in this photo run into thick trees. 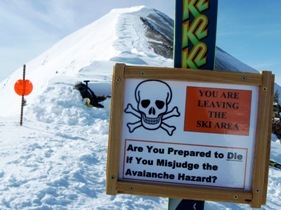 Up to 50% of avalanche fatalities are caused by trauma. If you ski off the backside (west facing slopes) of Bridger Bowl into the backcountry you'll be entering extremely complex terrain. It looks simple but its not. Skins are required to climb back to the ridge and re-enter the ski resort. In this area the snowpack is historically shallower and weaker than on the east side. 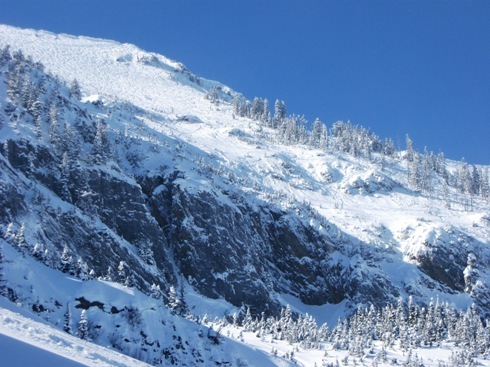 Avalanche paths run through dense trees and rocks that can cause serious injury. Many avalanche paths converge into confined gullies where potential avalanche victims will be buried deeply. Rescue is equally complex on the west side. Without use of a helicopter which is not guaranteed, any rescue would be long and arduous. The only way off the west side is through narrow drainages inaccessible by ATV’s or snowmobiles, and you would have to be carried out by a large team of rescuers. Even minor injuries become life threatening in this environment. Throughout winter large cornices slowly grow along ridgelines where predominantly westerly winds blow snow from the west side to the east side. As this happens large, overhanging drifts of snow form at the ridge top. These drifts are called cornices and resemble a wave of snow about to break. 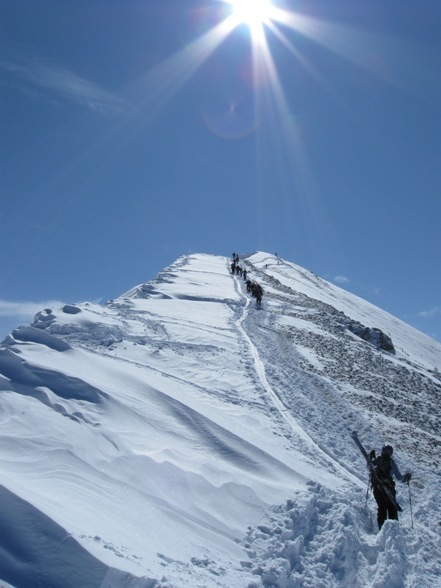 Cornices can break unpredictably and have killed many people playing in the mountains. The cornice itself can kill you and it may trigger an avalanche which can kill you. Stay far away from the edge of a ridgeline to avoid these monsters. This avalanche was triggered by a falling cornice. The victim walked onto the cornices and one broke. He fell with the cornice and was buried in this small avalanche. Just because someone skis a slope does not mean it is safe. Avalanches do not work this way. It could take 1 set of tracks or 100 before a slope avalanches. There are many other ways to determine whether or not a slope is safe, but tracks on a slope is not one of them. Experienced skiers examine the weather and snowpack very carefully and do not pay attention to what others are doing. Some days its really tempting to follow everyone else and feel safe surrounded by so many people. 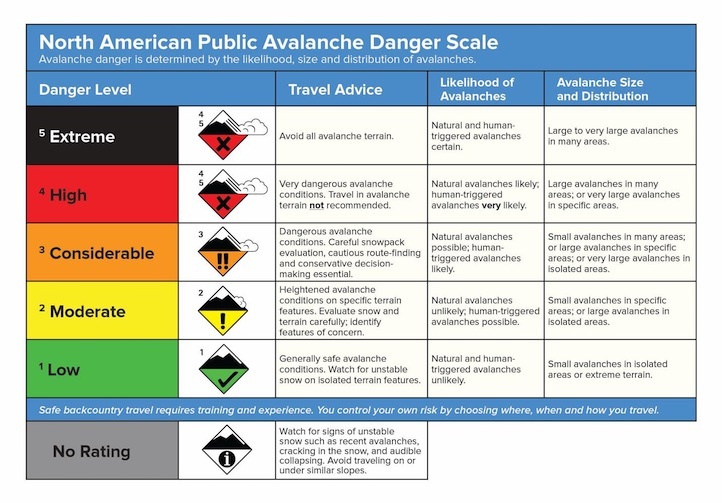 Unfortunately this only increases the odds that someone else will trigger an avalanche that will come down from above. More information about backcountry near Moonlight. 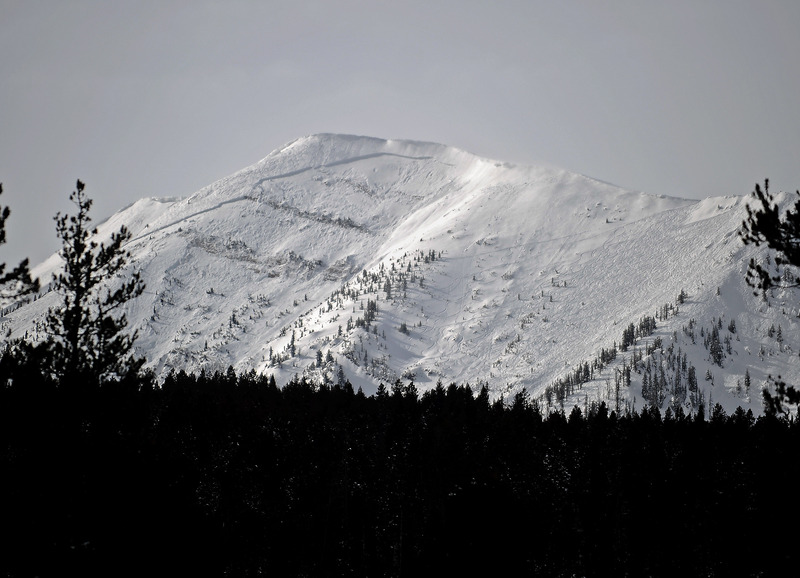 More information about backcountry near Big Sky. At the very least, parents should watch the Stay Alive video. It outlines the complexities involved with sidecountry skiing. Traveling in the backcountry requires advanced skills and clear decision making. Teenagers are not known for these two things, so think carefully before allowing your kid to venture out-of-bounds. Access into the backcountry is always open. There is no supervision. If you do not want your kid assuming the risks associated with the backcountry, you should make that clear to them. These access areas are just high altitude trailheads to the surrounding forest. There is no control, rules or laws that prevent anyone, adult or child, from crossing into the backcountry. If your kid has a beacon and shovel do not assume that they will stay within the ski areas. Outline your expectations clearly. Traveling in the backcountry carries great risk and personal responsibility. Every year adults die in avalanches. We do not want to see children die too. "Everyone else is doing it" The line of skiers hiking out of bounds is a powerful draw to adults and kids alike. These guys are 14 years old and have no rescue gear. Only one of them had been on Saddle Peak (out of bounds) before and he had only been there once. This lone skier stands on the south summit of Saddle Peak. This photo was taken from the north summit of Saddle Peak. Even though its outside the ski area with no avalanche control, you'd hardly know it from this photo. 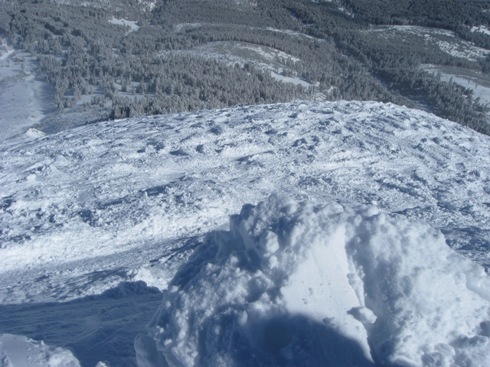 One of the most basic clues indicating potential avalanche hazard are recent avalanches. These skiers got lucky as they skied adjacent to an avalanche seen just right of their tracks.